It's been pretty exciting seeing Plow United as an active band again. They've played some shows, put out a full length album and now they're going back to another hallmark of the 1990's; the split 7". Plow United's contributions to this split are pretty great. "Gary Gygax" has a rolling drum beat and a fast dynamic punch. To me it sounds like it would fit right in the Plow II era. "These Six Words" is a bass fueled and palm muted guitar filled track where the band slows things down a little. It takes a special band to take on a lower key song without compromising the excitement of their fast tracks, but Plow pulls it off flawlessly. The Headies offer four short rippers on their side of the record. The songs are decidedly 90's punk rock sounding. They've got hooks in all of the right places, gang vocals that sweeten the choruses and a pretty ferocious drummer. When Plow is on the flip side of your record and I'm noticing your drummer, that's a pretty good sign. I do wish the songs were a little longer in general. I've always had a hard time with bands pumping out sixty to ninety second long tracks. Everything seems kind of rushed to me. 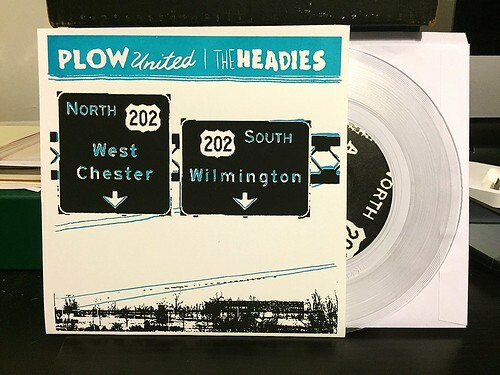 That being said, The Headies do it better than most and are a nice surprise since honestly, I would have bought this 7" no matter who was on the non-Plow side.